PHOTO Caption: Melissa Walker, an English Composition Lecturer, explains critical research and reading strategies to Roosevelt students. To help students develop necessary skills in understanding difficult course material, the English Composition Program hosted the Writing Workshop: Critical Reading and Student Group event last Tuesday in the Auditorium Building. 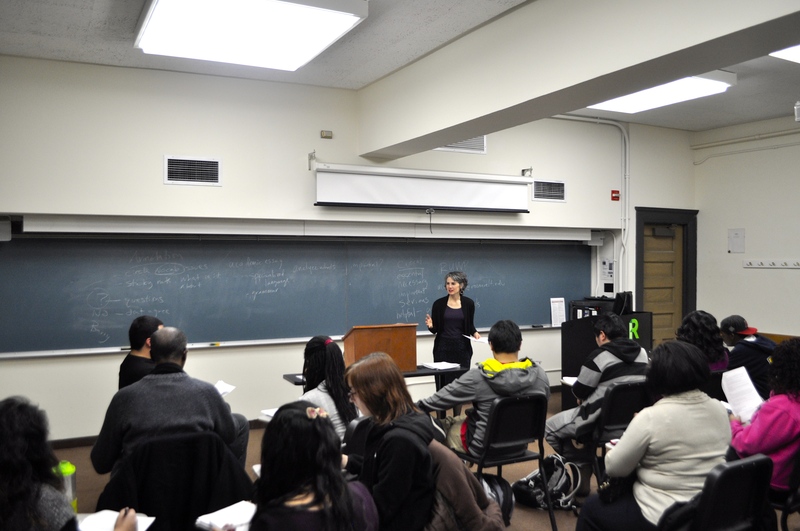 Melissa Walker, an English composition lecturer, spearheaded the one-hour writing workshop on how to take notes and be an efficient study group participant. Roosevelt students filed into the room, ready with pen and paper in hand. Most came in participation to their respective English 101 and 102 classes, while a few hailed from LIBS 201. Clayborne, a business major with an interest in social entrepreneurship, said he also came to the workshop eager to learn and improve on his existing literary skills. “I wanted to learn what I can improve upon and actually use that to strengthen myself,” he said. Walker said the main goal of the writing workshop was to help students engage with the reading they complete for classes. Near the end of the workshop, students were sectioned off into small study groups to analyze an academic article titled “Arts of the Contact Zone,” from New York University professor Mary Louise Pratt. Students were told to underline any difficult words or phrases and talk amongst each other to foster an efficient dialogue and team dynamic. The Writing Workshop Series consists of three workshops involving the research and writing process, which include reading, organizing ideas and writing with sources. While the workshop was intended primarily to help students engage more deeply with challenging texts, one of the students in attendance found that the workshop had accomplished its goal. “I learned that I should write more in my books — question more, note taking and how to really understand a hard text,” sophomore Casandra Candia said. Candia, a psychology major with a concentration in neuroscience, also wanted to see if the workshop could help her in the research writing landscape, which relates to her future career. With workshops still on the horizon, the goal for the English Composition Program remains the same: provide students with opportunities outside of the classroom to engage with matters of academic rigor. Information about future workshops can be found on the university’s online event calendar.